The Behemoth spilled the beans on their works in progress at Comic-Con today: a PS3 version of XBLA fave Castle Crashers and their enigmatic "Game 3," which sounds like some sort of competitive 2D action-platformer. It's coming up on the one-year anniversary of Castle Crashers' release on Xbox Live Arcade, and finally The Behemoth has some good news for PS3 owners: You too will know the delight of smashing bad guys and fighting giant cats, sometime in the undetermined future. 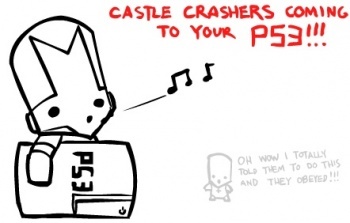 Yes, Castle Crashers is coming to PS3, though The Behemoth won't say when. Early reports are saying the game's basically identical to the XBLA version thus far. The Behemoth is mum on whether or not there will be new or exclusive content. On the other hand, another future Behemoth title does have some sort of solid time frame for release (2010): the studio's work-in-progress project only known thus far as "Game 3." There have been teases and trailers for this one, but it's actually playable now at Comic-Con. It's apparently a competitive-oriented action-platformer where you gather a whole bunch of players in a 2D stage and try to complete a certain goal: collecting gold, tagging walls with your team color, and uh, jumping on opponents' heads to extract their souls and get points? The twist here is that you get to customize your approach by picking certain items to bring into battle, like fireballs, iceballs, boomerangs and more. Other wacky skills, which no doubt represent but the tip of the iceberg, include the ability to do slide tackles and, as GameSpot describes it, "pose like a statue to harm enemies." Sounds neat - hopefully we'll hear more about it before long. Good for all the PS3 owners out there; it's a fantastic game and it needs to broaden it's horizons. I am anxious to see if there's new content though. Woohoo! I've always wondered about this game. Yay! best. game. ever. pick the red knight!!! ^^^^^This is what I literally said when I read the title. Pick the Green, max out Magic. Game over. Awesome news. Can't wait for it. I heard about this game on Newgrounds a while ago, and t looks awesome! I'm so glad I'll finally get a chance to play it! Ahhh, I always wondered what your avatar was. Yes, it is Pazzo... He floats and finds treasure. Sweet! This was one game I was hoping, but never believing would come to the PSN. Great news! So will 'Game 3' also make it's way up to PSN? I didn't quite grasp that. That game has so many cute pets, and such an awesome ending. Four player ownage. Game overer. I have TWO PS3's. Game. Overerer. You just got pancaked. I saw this on Youtube once. The second this comes out, I'm gonna have my wallet ready. Eskimo all the way man! Maybe this will satisfy your needs. (From one of your topics you made before). The hell with maybe, This will satisfy your needs. You may need to refresh my puny little earthling brain, which topic are you talking about? Umm...I believe it was the need of an RPG one or something in those words. Castle Crashers has some RPG elements. I was very excited when I read this on Joystiq yesterday. I've played Castle Crashers before, but only a few levels... Whatever, I know I'm buying it. Honestly, Castle Crashers is the only game I regret not having a Xbox360 for. But now that will change! The GREEN? Have you not seen the amazing might of the teddy bear? His magic RAPES all of the others! Well, the Xbox 360 has taken some games from the PS3, but none of them can compare to this, they DEFINETELY can't. If I didn't already have this on my Xbox 360, I'd explode from happiness.